As a woman, I felt a growing bond with Ix’ises as she discovered her unique talents and experienced the blossoming of womanhood and romantic love. 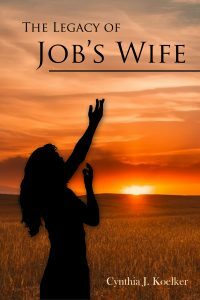 I felt validated as a wife by the author’s portrayal of Job’s unfailing husbandly love, slowly converting the heart of his sometimes sassy and demanding non-Jewish wife to a deep understanding of the importance of godly sacrifice and forgiveness. And as a practicing therapist, I appreciated the author’s effort to present a detailed life context for Job’s wife’s infamous remark. I also appreciated the author’s vivid and accurate depiction of Ix’ises’ experience of trauma and the deep major depression that ensued, marked by hopelessness and helplessness characterizing what has been called “the dark night of the soul.” As Ix’ises realizes the value of sharing her pain with others, she joins with those gathering all-too-frequently today in candlelight vigils, mourning the senseless shooting deaths of their children, family members, and friends. We mourn with them, both lost in Job’s unanswered “”Why?” and bound together by the same question. Koelker’s book is a reminder that, although God allows suffering, and we may not see its value at the moment, we can be confident that He will use it to accomplish good for many… perhaps simply through the retelling of a painful, yet glorious, story.